In which we discover chemurgy and Henry Ford’s obsession (the candles came later). Henry Ford in a soybean field. Taken from a 1946 Ford Motor Company ad. As the story goes, soy wax was invented in the 1990s when a chain of retail stores perceived a need for mass-produced candles made of a wax that could rival paraffin in price but that fit the image of being environmentally and health conscious. At the time, the store, The Body Shop, was selling candles made of beeswax, a naturally occurring wax which fit the image but not the price point. So the Shop’s beeswax candle supplier, a fellow in Iowa, began working in a lab to create a wax from vegetable oils. Around the same time, in Indiana, people in lab coats were working on pretty much the same thing, but with a narrower focus and a broader scope: they wanted to turn soybeans into anything and everything possible, including candles, in order to help America’s soybean farmers. That the Iowa lab coats and the Indiana lab coats would eventually meet up with lawyers in suits to haggle over patents and whatnot was, perhaps, inevitable. 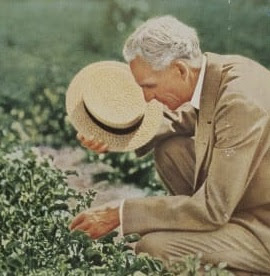 That soy wax would one day be widely marketed and touted as a “natural” candle wax—well, Henry Ford would be proud, for Henry Ford, of automobile fame, was a downright soy nut. Alas, no mention of soybean candles. There was once, however, a soybean car. Rumor has it that by 1935, every car Ford made contained a bushel of soybeans, and, at TheHenryFord.org, you can learn about the plastic that Ford made from soybean meal. It was so durable Ford could whack it with an axe, no problem. He had his picture taken doing this, so there is proof. A Ford ad from 1935 claims “We Paint Cars with Soy Beans.” In Greenfield, Michigan, Ford built a soybean lab and maintained acres of soybean fields. In 1941, Ford built a car completely from soybeans. This car had its skeptics, but, unfortunately, World War II came along, and the demands the war made on industry and resources put the kibosh on Ford’s fiddling around with soybeans. In 1947, at age 83, Ford died. But wouldn’t it be great if nowadays we could burn our soy bean candles in our soy bean cars while eating soy bean candy? I first became aware of the word “chemurgy” through the wax book by Warth. The word “chemurgic” appears toward the end of the section on beeswax. I couldn’t place the word “chemurgic” nor fathom its meaning, so I searched online and found the Journal of Industrial Ecology article. Chemurgy’s emergence is linked to the experiences of and aftermath of World War I, including the Great Depression, and various chemurgy councils that sprung up from the idea had an impact which lasted, again, until World War II. After the war, interest in farm-to-industry “chemurgy” was difficult to revive and the various councils eventually disbanded. Could there have been soy candles at Ford’s soy dinner after all? Today’s soy wax is created through this process of hydrogenation, and, from what I understand, it goes something like this. First, the oil is squished out of the soybean. Then, the oil is hydrogenated, meaning it is mixed with hydrogen. But, just as oil and water don’t mix, neither do oil and hydrogen. To make the mix work, a catalyst is required, a catalyst being kind of like the preacher at a wedding—they enable the joining of unrelated substances. As in 1934, today’s catalyst for soybean oil and hydrogen is copper, and a quick search online shows that to the candlemaker many different soy wax formulations are available. These formulas may include other waxes and what-not—recipes are, of course, well-guarded industry secrets. While one formula is said to work better for candles in jars and such, another formula will be better for molded pillars and another yet will prove superior for holding the candlemaker’s additives of color and scent. These waxes go by various brand names such as eco-this and eco-that and are designed to serve specific needs and demands of the commercial wax market—just what The Body Shop ordered. In Warth’s chapter on synthetic waxes, the waxes are divided into eleven groups. Under “Hydrogenation of Oils,” among many others we find hydrogenated cottonseed oil, known as Coto Flakes, which sounded to me like a breakfast cereal. I could hear the ad campaign: Does your appetite wax and wane? Even it out with Coto Flakes! Coto Flakes was, in reality, used as a substitute “for palm oil when coating the pickled steel sheets in the manufacture of tin plate.” Apparently, it was far less likely to become rancid. We also find Opalwax, which was the brand name for a DuPont product produced by hydrogenating castor bean oil. Opalwax had many applications, including “ … impregnating and coating papers, fiber board, leather, cork and textiles to make them grease, oil, and waterproof, [and] as a lubricant for electrical insulation.” It was also “claimed to be of value in the manufacture of candles, rubber-coated fabrics, polishes and finishes, carbon paper, inks, cutting oils, and for waterproofing and air breaking of air plane wings.” I went online to see if Opalwax and Coto Flakes were still around. It seems they are not. Soy wax is now fairly ubiquitous in the scented candle market as it is plentiful and inexpensive. The size of the soybean crop in the U.S. is second only to corn. A July 2017 article on AgWeb.com leads with “The world’s soybean crop has grown by leaps and bounds since 1990, growing 231%.” When it comes to soy, Henry Ford was ahead of his time. Old Efforts at New Uses: A Brief History of Chemurgy and the American Search for Biobased Materials, Finlay, M., Journal of Industrial Ecology, Volume 7, Issue 3-4, July 2003. History of Industrial Uses of Soybeans. Page 1738, as well as preceding and subsequent pages. Soyinfo Center, 2017. Soy wax development getting new attention, DeWitte, D. TheGazette.com, Cedar Rapids, Iowa, August 10, 2012. William J. Hale obituary, New York Times, August 9, 1955. Soybean World Production Trends, Potter, B. AgWeb.com, July 24, 2017.